How Do You Help a Parent Who Has Generalized Anxiety Disorder? The Anxiety and Depression Association of American reports that the risk of anxiety does not decrease in old age. In fact, generalized anxiety disorder (GAD) is very common in the elderly. The risk is higher if the senior has fallen or dealt with a severe, sudden illness. Could your mom or dad be dealing with GAD? 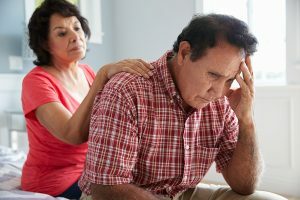 Learn more about the symptoms and things you can do to help your parent. GAD goes beyond the normal worries your aging parent may have. With GAD, symptoms vary from person to person, but the symptoms last for at least half a year and may never go away without help. A parent with GAD may be overly tired, even after a full night’s sleep, and may have a hard time concentrating. Your mom or dad will seem restless and tense. Mood swings are common, and you might find your parent snapping at you for no valid reason. A person with GAD worries day and night, may find worries keep him or her from sleeping, and can lead to very terrifying panic attacks. With the panic attacks, the heart may race, muscles tighten and feel painful, and your mom or dad may feel out of control and not know what to do. How Do You Help Your Elderly Parent? Discuss your concerns about GAD with your mom or dad’s doctor. Therapy may help ease the fears that seniors with GAD face. If therapy alone isn’t helpful, prescription antidepressants can help. Getting out of the house for daily walks is beneficial, too. If your mom or dad fell and needs help with mobility, you can hire a caregiver to help. A balanced diet that avoids excessive sugars and caffeine can also be helpful. One thing that seems to be true of people with GAD is that having a supportive person around can help keep some of the fear and uncertainty away. Caregivers can help take some of the stress of managing daily chores, planning a healthy weekly menu, and getting out of the house. Talk to an elderly care agency about the benefits of caregivers. Your mom or dad may find it easier to handle daily routines and ease worries about falling or being too ill to manage the household if someone is around for assistance. Having a caregiver around for companionship can be a huge help. Call an elderly care agency today to discuss the best schedule to help your elderly parent dealing with GAD. If you or an aging loved one are considering elderly care in Matawan, NJ, please contact the caring staff at Lares Home Care 888-492-3538 or 732-566-1112.